It&apos;s not just a division of political ideologies that ails America. It&apos;s a division of design. 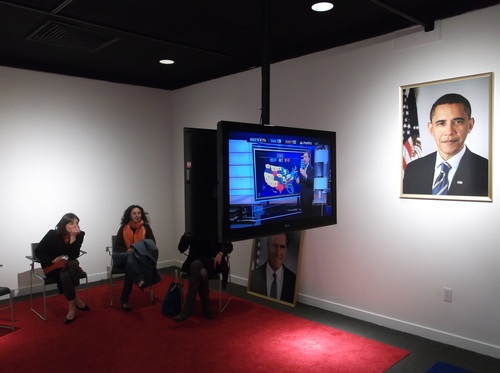 That was the observation of two University of Utah educators watching the results at the Utah Museum of Contemporary Art&apos;s exhibit, "Your Land/My Land: "Election &apos;12." The graphic presentation of the two TV networks being broadcast in the exhibit – MSNBC on the "blue" side, and Fox News on the "red" side, were a contrast in graphic styles, said Kerry O&apos;Grady, education director for the Utah Museum of Fine Arts. MSNBC&apos;s graphics were "lean, and give you the information smoothly." The Fox graphics are "animating the numbers." Angela Espinosa, a professor of Spanish at the U., agreed. Fox "doesn&apos;t provide the information long enough. It&apos;s distracting and confusing," Espinosa said. "It was like looking at a poorly designed webpage." O&apos;Grady wanted to see the results in the context of the minimalist exhibit, which artist Jonathan Horowitz mounted in seven locations nationwide. "I&apos;m interested in the project, in the juxtaposition of the performance of politics with the substance of it," O&apos;Grady said. Espinosa said she "thought this would be one of the more civilized environments" to watch the results. She was surprised that "it wasn&apos;t more contentious, because I thought people would self-identify" as red or blue.